A reliable source for Dust Control Systems information and a resource for accessing leading Dust Control Systems and suppliers. Dust Control Systems Dust control systems are products responsible for filtering and collecting the hazardous debris in industrial environments where high volumes of toxic dust are produced. Serious health issues can develop from inhaling toxic dust, particularly related to skin and respiratory issues. Also, it can make it harder for workers to see what they're doing, which can cause injury or damage to the machines they run. 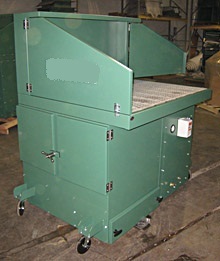 Therefore, finding a proper dust collector is vital for many industrial and manufacturing companies. Various styles and sizes are available to fit the budget and space requirements of every customer. Other considerations that play a major role in purchasing a dust control system includes maintenance demands, if chemical or non-chemical filtration is necessary and the moisture level of the air being processed. Of the many styles of dust control systems, bag houses are the most well-known because they are cost-effective and efficient. Sucking the air in through ducts, a filter fabric within collects the dust into a dust cake, which is also known as a filter cake. With the dust cake accumulating the toxic aspects of the air, clean air is able to cycle back out. Another popular dust collector is the jet dust collector, which has few maintenance obligations and is a more compact machine. Containing a series of bags to collect the dust in the air, the jet dust collector has its own ingenious system for cleaning out the bags. After the clean air is filtered out, short bursts of compressed air causes the dust cakes in the bags to release from the fabric and fall into a storage hopper at the bottom of the machine. Because of clever engineering, involving valves and constricted areas and powerful bursts of air, the jet duster is quiet, extremely efficient and able to use the same filters for longer since it basically cleans itself. These are just two examples of the many styles of dust control systems available, including custom made models to fit any need.